Do you want reliable and affordable roofing in Cibolo, TX? ECO Commercial Roofing can assist you with all of your roofing service requirements, so give us a call at (833) 200-0571. Customer satisfaction is a primary goal of ours, and we can supply you with almost any type of roof assistance you might need. We have been business and residential roof contractors in the Cibolo area for decades, and our professionals are established members of our community. Our roofers are always happy to help our clients with any inquiries or worries about roof systems, and we provide a selection of solutions too. Anytime you are looking for a better roof experience, call the professionals at ECO Commercial Roofing for assistance. A vital asset to any business or home service is a dependable and honest contractor. Every one of our contractors goes through training to industry standards, and we are sure to only use top quality products from brands like Conklin. Because the kind of roofing you install can affect the value of your property in years to come, we are sure to carry large selections of materials as well as styles for you to pick from. Everyone enjoys an especially stylish roof, but be sure to consider all of the long term benefits involved, as well. Additional factors to consider include your budget, along with the type of structure that is needing the roof. Our crew is glad to provide you with more than a few options. Dependable roofing services are our primary objective, and we can deliver that in the form of repairs, replacements, and installations too. Our professional services are applicable for commercial, home, and industrial projects alike. Our commercial roofing services are designed to work for business owners who have low-sloped or flat roof systems. Flat roofs need a particular degree of skill in order to ensure the longevity of your system, and enduring resistance to moisture, protection from ponding. Our industrial roofs, contrarily, are designed with particularly strong materials to withstand the expected wear and tear typically put on a facility’s roofing system. Last but not least, our residential roofing services can help with a variety of residential roofing types and materials, with everything from repairs to replacements. Each roof company has their specialty, and ours is roof restoration along with roof coatings. In our expertise, using top quality materials such as Conklin can really make the difference between a roof coating that lasts, and one that does not. Our roof services are designed to be some of the best roofing in Cibolo, TX, with particular craftsmanship, and impressive customer satisfaction. If you are interested in discovering additional information about how roof restoration with Conklin coatings can extend the longevity of your roof system, give us a ring today at (833) 200-0571, or look into the links below! Roof restoration is an excellent way to improve the overall surface of your roof, while also avoiding additional damage. Using Conklin roof coatings, our team of experts can add an additional decade to the longevity of your building’s roof! A roof removal and installation is expensive and time consuming, but a roof restoration can provide you the protection you need for a fraction of that expense. The main technique of roof restoration depends on top quality Conklin roof coatings. Such coatings are available in a variety of varying materials, and we are able to help you determine which one will work ideally for your requirements. When choosing a roof coating, we consider the original material of the roofing, as well as the types of damages that roof may be sensitive to. The majority of roof coatings can even stick directly on top of your existing roof! To discover more, call our team now at (833) 200-0571! Elastomeric Roofing Elastomeric roof coatings come in a variety of kinds, and are an affordable way to defend your roof. Our flat roof services are meant to help out several different types of commercial roofing, such as low-slope as well as flat roofs. Proper installation is key if you want to avoid problems such as leaking, punctures, and early failure. 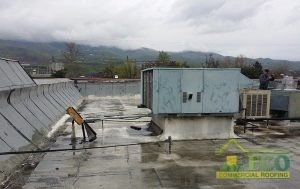 When we make a flat roofing system for a client, we craft that system to protect and serve their structure for decades. 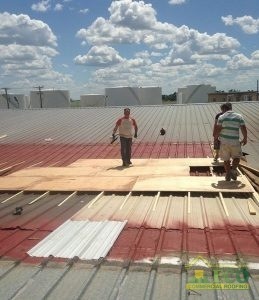 ECO Commercial Roofing is the company you can depend on when you need resilient commercial and residential roofing services. We don’t only provide our professional roofing in Cibolo, TX, but also in the surrounding areas. Deciding to invest in a building’s roof will pay off very nicely in the future. Contact (833) 200-0571 with any questions, and find out how we can best serve you!